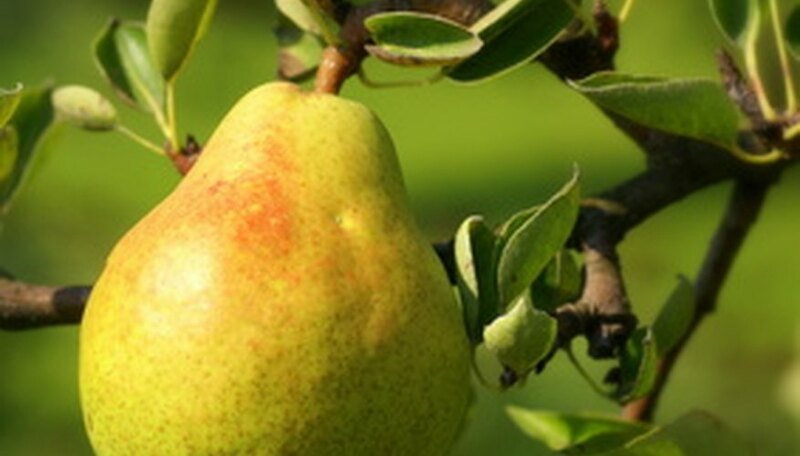 Some gardeners today are choosing a dwarf pear tree when deciding about fruit trees. One reason is that it is easier to care for a dwarf pear tree--ladders generally aren't required for pruning, for example. Also, dwarf pear trees simply look nicer in yards that don't benefit from an overbearing full-size tree. You should prune dwarf pears in late winter or early spring, while the tree is still dormant. A major reason for pruning a dwarf pear is to open up the canopy to additional light and air to increase fruit production and guarantee a healthier crop. Remove all dead or diseased wood first. Cut back to the trunk of the tree. Remove all suckers growing from the roots or on the trunk. Identify suckers by their smooth skin in place of true bark. Suckers can be broken off or cut with shears. Cut branches that are rubbing against each other, as this can cause wounds that allow insects and disease to enter the tree. Cut every branch all the way back to the trunk of the tree or back to another main branch. Leave the growth node (or ring) on the trunk when making your cuts. Remove all branches that are growing at a downward angle or are growing sideways across the canopy of the tree. Remove any large vertical branches that are competing with the main trunk of the tree. The tree should have only one trunk. Cut the very top of the tree back to the first leaf node. This keeps the height of the tree down, and encourages the tree to become bushier and to put on more fruit. Do not over-trim your tree. Other than the specific cuts mentioned in this article, do not trim new growth. When cutting branches over 1 1/2 inches in diameter, use what is known as the 3-cut method. Start by making a cut from the underside of the branch approximately 3 inches away from the trunk. This upward cut should be about halfway through the branch. Then, approximately 6 inches from the trunk, begin a downward cut all the way through the branch. Before this cut is completely through the branch, the branch should break at the point of your underside cut. Now simply cut off the 6-inch stub and you're through, without the branch yanking off bark or doing any other damage to the tree.